← Tools of the Trade – Left Behind. In referring to the color of type I’m not talking about type that is printed in blue, or red or yellow or green but instead I’m talking about a block of copy where the type is all in black. If you squint your eyes and look at a block of black copy it’s really just a mass of gray color. Whether you are a designer or not you can – and should – control that color. That color plays an important design role. It also plays an important “psychological” role in any marketing material. It’s easy to do and should become routine for anyone trying to appeal to a market. Plain and simple, a mass of one shade of gray visually is not very appealing. In fact it’s boring and it will make your message appear boring and monotonous. There are 3 easy ways to change the color. First, consider creating a subheadline if relevant and maybe increase the point size compared to the body portion of your text. Secondly, consider creating more paragraphs if you have a lot of text. 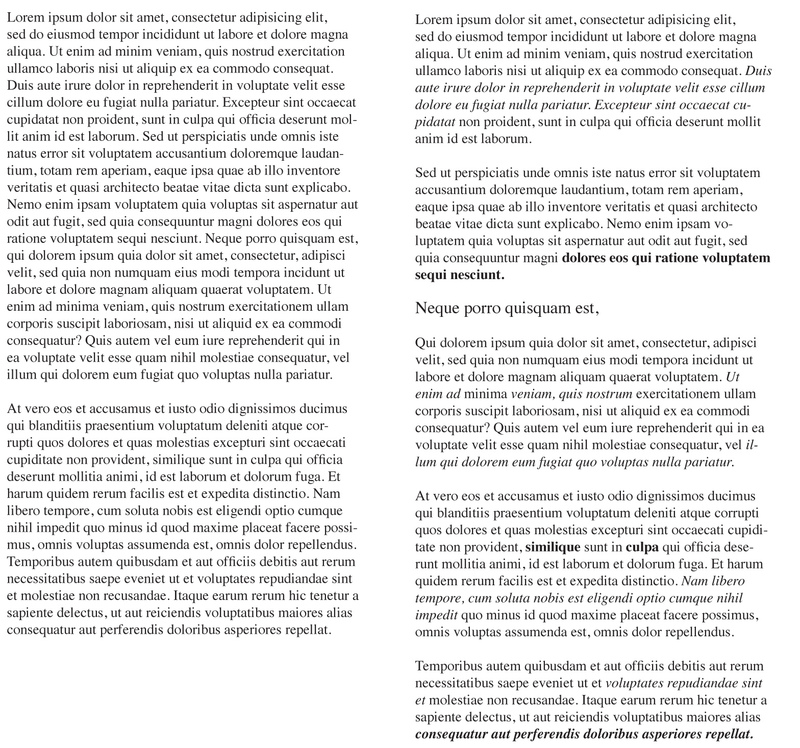 You definitely want to avoid long paragraphs as they create large masses of gray on a page. And lastly, use italics and bold within your text. This last tip really helps vary the look of a block of copy and breaks-up the monotony when reading it. Look closely at the sample of text below to see what I mean. Writing copy for marketing purposes is a little different than writing for other purposes. Usually the intention is to inform and probably influence the reader. You are in control of that influence and by discretely italicizing and bolding some of your text you can put emphasis on those areas where you’d like to give a bit more attention. However, as with most things related to design, moderation is the secret. Don’t bold or italicize too much or you’ll only lessen the intended effect. I like to tell people to write as if you are speaking directly to someone. Emphasize those items in your copy you may emphasize in your speech pattern. By following just these few simple tips you can change what would normally be something pretty plain into something with a little more pizzazz, appeal and possibly a little more influence. Below are two columns of text. Each column containing the same “greeked” words. (More on that in this blog.) One is straight copy, the other using some of the tips I mention above. The difference is noticeable. Which do you gravitate to and want to read?